Wild Duck star cluster astrophotograph by Babak Tafreshi. The Wild Duck cluster, a prominent sight in summer skies despite the background of the Milky Way. I find some astronomical objects curious not so much in and of themselves, but also because of where they’re located. 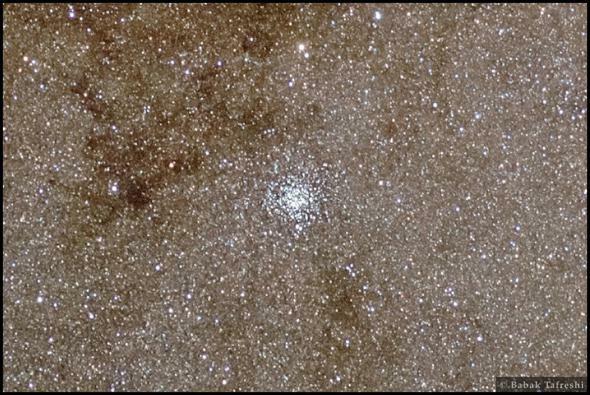 Take M11, also called the Wild Duck Cluster. It’s about 6,000 light years away, and it’s an open (or galactic) cluster consists of about 3,000 stars. The cluster is something over 200 million years old, making it middle-aged; after a billion years or so such clusters dissipate as their stars interact gravitationally, ejecting members ones after another. It’s still pretty compact, and its overall triangular shape is what gives it its name, looking if you squint) like a flock of ducks flying. A closer look at the cluster. But what I like about it isn’t what it is, but where it is. 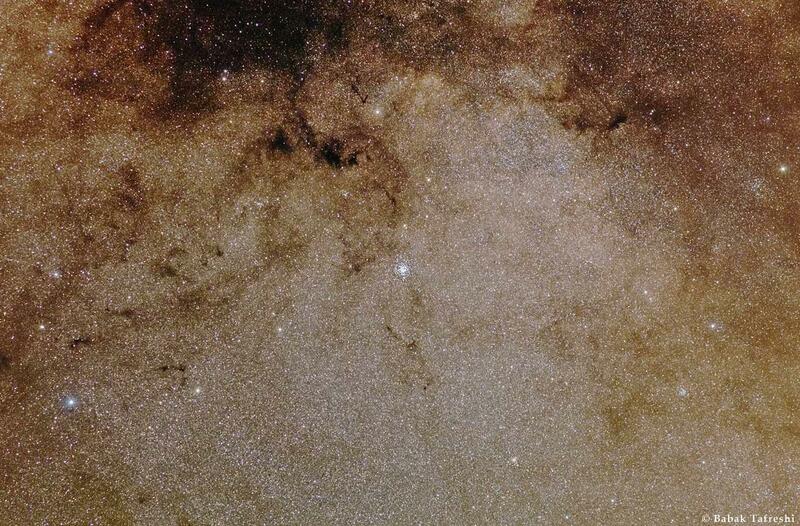 It’s located in the constellation Scutum, a small region of the sky near the galactic plane. Our galaxy is a flat disk, and we’re inside it, so we see it as a broad band across the sky. By eye it looks like a fuzzy glow, but through a telescope it resolves into millions of stars. Billions. And that’s why M11 is so cool: It sits in the foreground of those myriad stars, a knot of bright jewels set against a vast backdrop of millions of them. The photo above is by my pal Babak Tafreshi, whose work commonly graces this blog (he has an annotated version as well on his own site). He took this shot from Iran. I love how you can see individual stars in the background, and the fainter ones just all merge together into that deceptively murky glow. Look how beautiful the dark wisps of interstellar dust are, too, some dense enough to totally block the light from stars behind them. Dust is an interesting physical component of our galaxy, but if you study stars it’s a pain, like trying to bird watch in a thick fog. But it sure makes for a lovely shot. M11 is a great object; it’s easily seen in binoculars, and through a telescope it hints at its densely packed stellar citizenry. It’s up best in northern hemisphere summer, unfortunately, but if you get yourself (or someone you know) a telescope for the holidays, keep this one in mind for when it warms up outside.